Introducing Wink, a whole new paradigm in the luxury hotel market. With so many hotel chains fighting for the attention of modern travelers, I designed a digital experience that provides the comforts of home . . . when you're away from home. • What is our hotel brand? • What makes for a great hotel stay? Based upon these and other questions, I created an upscale digital experience that pushes innovation through intimate, whenever, wherever, mobile app technology. Wink Hotels is a conceptual brand built for and around 21st century living. As a result, I created a fashionable logo. I tied in contemporary brand colors that are upscale and approachable. I wanted users to interact freely with the hotel environment. 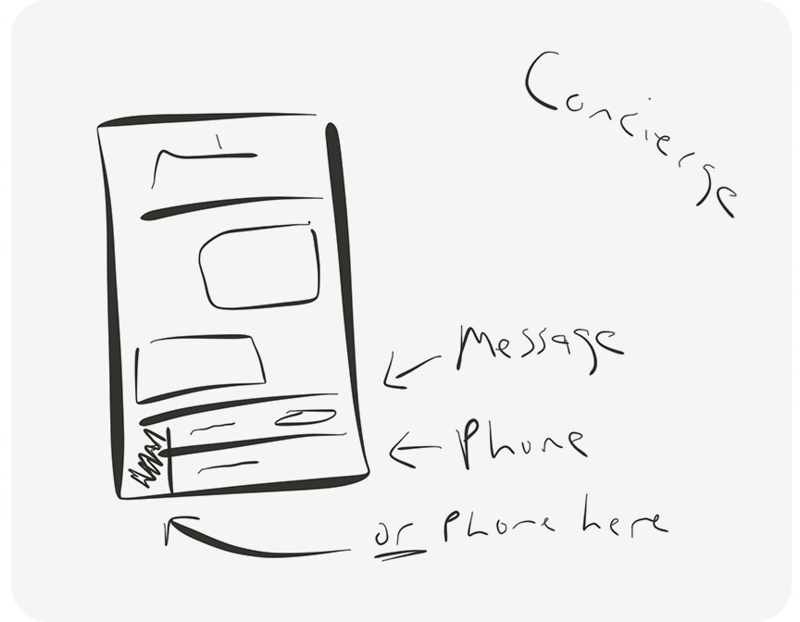 As a result, the mobile app is designed to be intuitively simple. • Consistency: The use of predictable patterns across the navigational structure help to enforce orientation. • Clarity: Features are legible at every stage. Navigation is organic. And, the focus on functionality motivates the design. • Depth: Visual layers impart vitality and navigational flow. Layered hierarchy orients the user within the app. • User Account: This is the foundation for the user experience. All elements of the hotel experience expand from this layer. It supports the management of technical details relating to user accounts. • Main Menu: This layer is the hub for users to access the various features within the app. Users can move forward to featured elements or swipe down at any time to access the detailed account information underneath. • Featured Element: Sliding above the main menu, this module hosts the selected main feature. When the user is finished interacting with the element, they swipe down and the module slides away. When designing conceptual artwork, I define general shapes, structure, and element spacing. It's not very pretty. For this project, I created 15 different navigational and visual concept sketches. Once I defined the necessary elements, I focused on detailed, polished prototypes. The account information screen is at the base of the navigational hierarchy. It's a visual representation of the layered hotel experience. All of the amenities and services expand upon this foundational element. 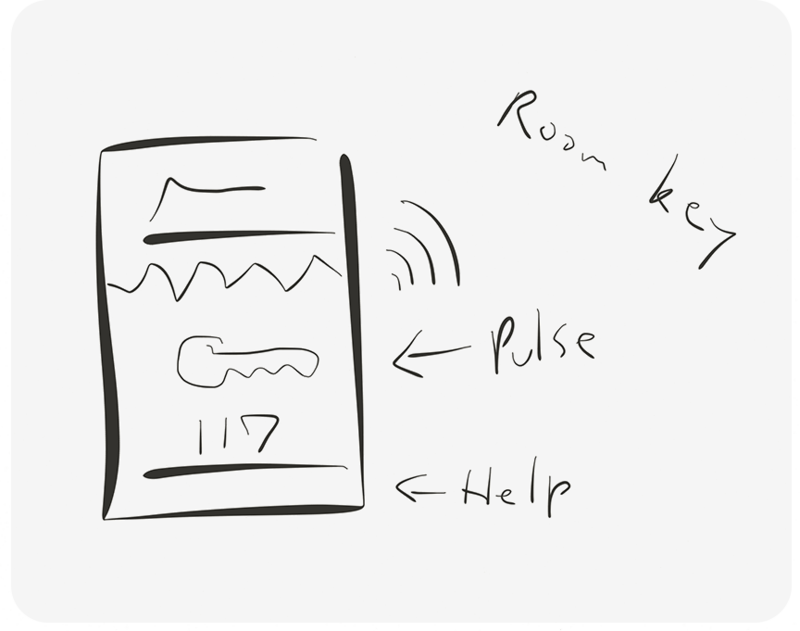 With the advent of modern hotel automation, it is fitting to incorporate a digital room key. Because this is a new technology, guests may not be familiar operating a digital room key. It was imperative that I keep the interface simple and non-threatening. After all, technology should be easy to unlock. A great "home away from home" hotel experience revolves around comfort and convenience. So, why not create an ultra-casual, chat-based concierge service? This feature provides users with a written record of hotel communication. And, it's super convenient when you don't want to talk on the phone. Nothing says "home" like a comfortable room. The thermostat design is both intuitive and engaging. It's a breeze to operate. Simply slide the temperature bar to the desired setting. I utilized a collapsible menu system to maintain clarity between the two features. Within each section, I implemented a paging effect allowing users to scroll through the various selections. It's beautifully straight-forward. And, it sets the mood.